Towson’s men’s and women’s teams finished eighth and fourth, respectively, at the nine-team Bucknell Invitational this weekend in Lewisburg, Pennsylvania. The results didn’t surprise Head Coach Pat Mead, given the team that went to Bucknell. The lone win Towson took home was from junior diver Natalee Szopo. She placed first in the three-meter event. The same event in which senior Lyndsey Dickson came in fourth and junior Hannah Ostrem was fifth. Szopo later claimed second-place in the one-meter board. Junior Molly Arceri took fourth in the event. 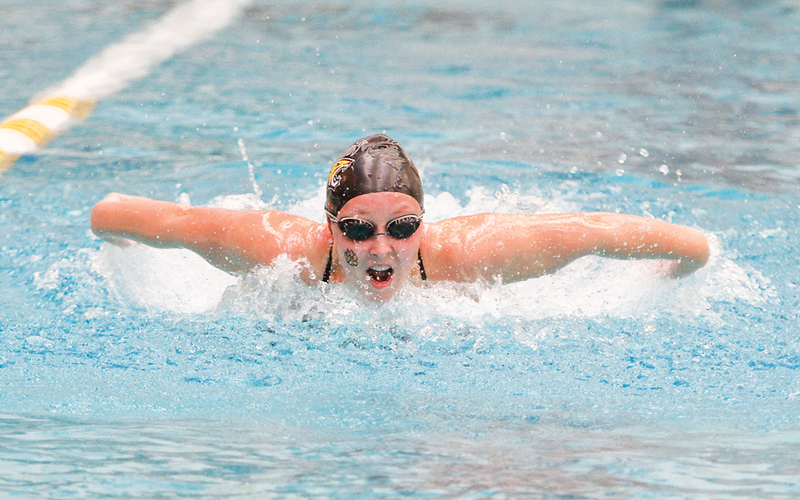 Another bright spot came from freshman Kendall Krumenacker, who posted solid times in the 500-yard and 200-yard freestyle events, but her most impressive feat was her second-place finish in the 200-yard backstroke. She set a Towson record with a time of 1:58.78. Freshman Corie Morton was “phenomenal,” according to Mead. She placed third in the 500-yard freestyle, fourth in the 1,650-yard freestyle and seventh in the 400-yard individual medley. Morton was also a part of the relay team, along with senior Taylor Paskoff, senior Taylor Jarsocrak and junior Lynn Juan, to come in third in the 800-yard freestyle race, the best finish by a Towson relay team throughout the entire meet. Paskoff added a fourth-place finish in the 200-yard butterfly. Jarsocrak participated in the 1,650-yard freestyle, coming in sixth place. “On the guys side, we had some bright spots,” Mead said. “Brandon Ress and Tim Schade were both good. But we were looking for a little bit more from some of the other guys. Ress, a sophomore, placed sixth in the 500-yard freestyle, 15th in the 400-yard individual medley, seventh in the 1,650-yard freestyle and 25th in the 200-yard breaststroke. Schade, also a sophomore, came in 15th in the 500-yard freestyle and 13th in the 1650-yard freestyle. Both men were a part of the 800-yard freestyle medley relay, in addition to sophomore Noah Pritchard and freshman Matthew Sieffert, and took sixth in the event. Pritchard added an eighth-place finish in the 400-yard individual medley, a fifth-place finish in the 200-yard butterfly and a 10th-place spot in the 200-yard backstroke. The Tigers will be back in action on Dec. 4 at the U.S. Winter Nationals being held in Greensboro, North Carolina.